I’m slowly going back over some images that I shot over the summer to find ones that I either overlooked or never got a chance to work with. This image comes from the 2011 Concours d’Elegance of America show held at St. John’s near Plymouth, Michigan. 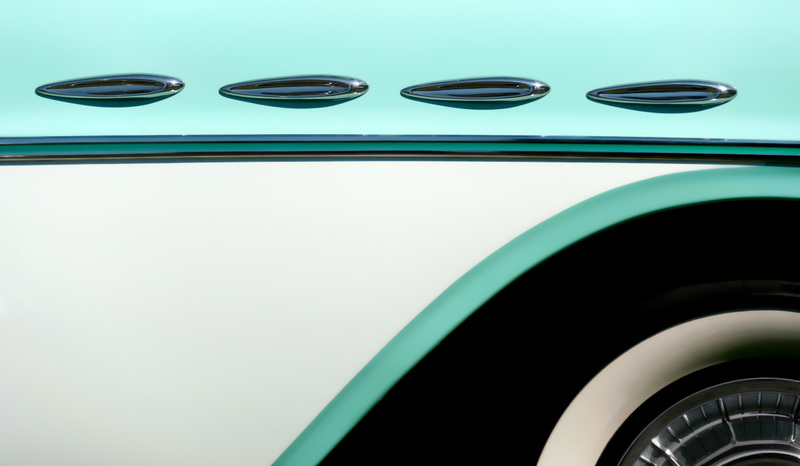 The car is a 1957 Buick Century Caballero Estate Wagon. What caught my eye when I saw it was the interesting “Mint Green and Dover White” color scheme and interesting styling. As I was processing the image, the thought crossed my mind that the image sort of looks like the Eye of Horus with the exhaust ports being the eyebrow and the tire being the eye. For processing I did two main things. The first was to correct some of the lens vignetting created by the 28-300mm lens. As convenient as this lens is with it’s wide focal range, it does exhibit vignetting and several focal lengths. Fortunately this was pretty easy to correct using the lens correction feature of Lightroom. The other thing I did was to use the Topaz Detail filter on ‘Abstraction’ to smooth out the image. This eliminated some reflections that I didn’t care for and made the image more about the lines and curves of the shot. I did mask over the effect on the faux exhaust ports and the tire. Comments and feedback always appreciated! Love this composition! It’ so clean and balanced, and abstract enough to be fascinating but with just enough hints that you know what it is. Wonderful composition James and I love the smoothing effect you applied! OK, this is a rocking cool comp. Also, really like the color and the blinging chrome on this. Is that the paint color reflecting in the chrome, or did they actually paint the gully in the same color? Yes, the gully is painted, it’s not just a reflection. I can’t get enough of your automotive work, James! This is absolutely top drawer. Love the simplicity. Love the lines.